We all know how precious our eyes are. Moreover our eyes work round the clock. Without eyes the life really would have been colourless. We would have spent our life without any fun and activity. Hence it is very important to take care of our eyes on the daily basis. 1)Wash Eyes:First step in taking care of eyes is to keep it clean from dirt and bacteria. Read this article to know more on how to wash eyes and precautions to keep in mind while washing the eyes. 2)Wear Sunglasses: We should always wear sunglasses to prevent eyes from the harmful ultra-violet rays of sun. Do wear the sunglasses even on the breezy days to prevent the dust entering into your eyes. 3)Walking barefoot on wet green grass: This is the ritual at our place. Every morning we go to the garden and walk barefoot for at least 20 minutes. 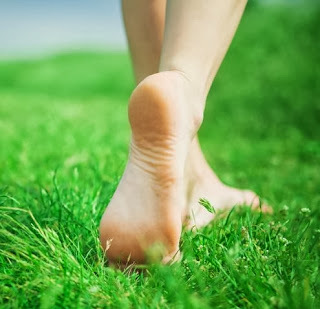 It is said that walking barefoot on wet green grass is good for our eyes. We have been following this since years. 4)Look at the distance: Follow the 20-2 rule. After every twenty minutes of staring something give the two minute break to the eyes. Be it reading or working on the computer or watching your favourite movie on the television. After every 20 minutes take the break of 2 minutes to relieve your eyes. At this time look as far as you can. This will help in reducing the strain on your eyes and give the relief. 5)Blink: Various researches have proved that blinking eyes is good for the eyes health. Blink as fast as you can for a minute after ten minutes of continuous staring. You will get the relief instantly. Click here to read more on various exercise for eyes to strengthen eyes muscles. 6)Make-up: Make use of good eye products that suits your eyes. Do not forget the remove the make-up before going to bed no matter how tired you are. Eye make-up when not removed on the regular basis will spoil the health of the eyes and can result in the infection into the eyes. 7)Do not scratch or rub eyes harshly: Wash your eyes immediately if you feel irritation or burning sensation in your eyes. Though tempting, you should never rub your eyes harshly. It will give you the temporary relief but in the long run it is going to harm your eyes health. 8)Cry: Yes you read it right. Crying helps in washing the eyes and removing the bad particles when tears roll down from your eyes. So next time when you are upset do not forget to cry your heart out. This has twin benefit of relieving yourself from the pain and cleaning your eyes. These are the different ways I follow to take care of my eyes. Do share with us how else you take care of your eyes.